Weight 249 pounds. 4460 pounds. 4000 pounds. 3700 pounds. 4400 pounds. Dimensions 62 x 27 x 24 inches. 137 x 35 x 80 inches. 137 x 35 x 76.5 inches. 141.6 x 51 x 72 inches. 80 x 75 x 13 foot 3 inches. Power Source Gas. Diesel. Diesel. Diesel. Diesel. Engine Capacity 11.7HP. 74HP. 56HP. 60HP. 74HP. Warranty 1 year warranty. 1 year warranty. 1 year warranty. 1 year warranty. 1 year warranty. How to Select the Best Commercial & Industrial Stump Grinder? When you’re on the hunt for the best commercial and industrial stump grinder for the money, much care and thought must go into the process. Generally, commercial and industrial stump grinders require a little more money to be spent. This is why it’s important to make sure you choose the right product for the job. Within our buying guide, we aim to show you the very best manufacturers, brands and models within the commercial industry. Review each commercial tree stump grinding machine carefully to ensure the potential winner is one that will complete the job to your high standards. Believe it or not, there’s such a thing as too much power. That is why it’s important to determine what your commercial or industrial stump grinder will be used for, before you go ahead and purchase it. Are you only looking to grind a few stumps, or are you clearing an entire section? Industrial grinding equipment, root cutters and other such tree power equipment options are all available to suit both homeowners and professionals. The key is being able to tell the difference between the two. Safety requirements of commercial and industrial stump grinders are comparable to those of a homeowner’s stump grinder. Operators of either kind must ensure all parts are free of debris and are in good condition. Guards must be free from cracks and imperfections, and face and eye protection is recommended. Remember, a commercial and industrial stump grinding machine is far larger and more powerful than one designed for a homeowner. This means it’s more dangerous. A tree stump grinding machine for professionals is often only as good as its operator. If you don’t use the grinding machine as it’s supposed to be used, you may run into efficiency problems. This could include not being able to cut as deep, losing power and not delivering the RPMs the machine is capable of. Pay careful attention the operator’s guide and make sure you’re using the machine as per its instructions. Features vary depending on the manufacturer or brand. However, all manufacturers aim to make their stump grinders as low maintenance and as easy-to-use as possible. Some are compact to fit into smaller spaces, whilst others come with industrial strength cutting wheels with premium brand teeth such as Green. Each also offer different features within their engines to make them as cost effective to run and maintain as possible. Maintenance requirements can often depend on the style of the stump grinder, as well as the user. Many businesses within various industries require their operators to follow checklists, undertaking regular and strict maintenance to keep the machine in the best condition. Checking all guards and moving parts for breakages, missing pieces or imperfections. Sharpening dull teeth and replacing broken ones. Removing all debris from moving parts. A good, top rated commercial tree stump grinding machine can cost anywhere from $5,000 to $10,000, and sometimes more. The key is to first establish the features you can’t live without, and find a stump grinder that meets those needs and is competitively priced. You can often find the best deal online, you just need to do your homework. It’s very powerful in comparison to its size. The instruction manual is very thorough and easy to understand. The teeth are easy to rotate and remove. It’s not self-propelled which, for the cost, you would expect it to be. The handling and manoeuvrability is poor. It requires a substantial amount of maintenance. Some parts are poorly constructed. Dimensions: 62 x 27 x 24 inches. QHow many RPM can it deliver? AUp to 12 inches below ground. Husqvarna is known for its quality outdoor power equipment, therefore it’s unsurprising that the brand has delivered once again. Any Husqvarna product owner will know that an unbelievable amount of power is contained within a small Husqvarna frame. With this stump grinder, the Honda engine is very powerful, it runs very well and will cut through the toughest of stumps. It’s also for sale at a relatively affordable price, and comes with an extensive manual for accurate use. Overall, it’s one of the best stump grinders for the money. Just ask any current operator. Check out what other people who purchased this product think about it. Read Husqvarna SG13 commercial and industrial stump grinder reviews. It can get into very tight spaces, unlike many other stump cutting machines on the market. The parts needing regular maintenance are easy to access. It makes light work of the toughest stumps. It’s all-wheel drive to take you through tough terrain with relative ease. It requires a lot of maintenance. It has a limited market due to being mainly for professionals. Dimensions: 137 x 35 x 80 inches. QWhat is the wheel diameter? QHow many teeth does it require? ADeutz TD2.9L Tier 4 Final. QHow deep into the ground and above ground can it cut? A31 inches above, 25 inches below. 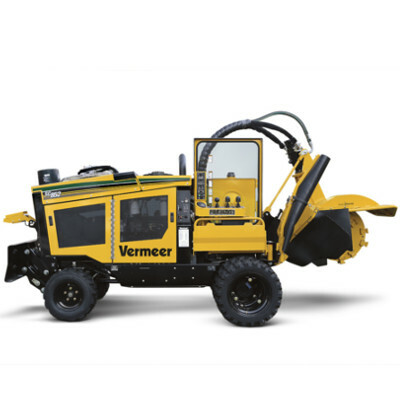 Taking the stump grinding machine market to the next level is this Vermeer SC852. Built with operator safety and comfort in mind, it’s an all-wheel machine which makes short work of tricky stumps in all environments. It can fit through standard gates, is powerful and is priced rather competitively on the market. It’s only suitable for professionals, but those who do purchase it will see the benefits immediately. The only true downside is its warranty. For the price of the machine and its size, you would think it would come with a better warranty. However, it’s warranted for just one year. Aside from that, it’s top rated and comes highly recommended by a range of buyers. Check out what other people who purchased this product think about it. Read Vermeer SC852 commercial and industrial stump grinder reviews. It can cut higher and deeper than several other stump cutters on the market. It has variable speed control to give the operator better control over the cutting operation. It has a front-mounted chip blade to remove stump debris from each job site. All components are rather easy to access for maintenance. It can fit through standard gates. It has a smaller target market and isn’t overly suitable for homeowners. Dimensions: 137 x 35 x 76.5 inches. QHow many teeth does it need? Don’t be fooled by the happy and fun color of this Vermeer SC552, as this machine means business. If you’re looking to clear a lot before the day’s done, you need to get your hands on this commercial tree stump grinding machine. Not only does it cut through stumps like a knife through hot butter, but it even cleans up after itself with its front-mounted chip blade. For the professional looking for a less physically demanding solution to tree stump removal, this Vermeer product is the answer. Check out what other people who purchased this product think about it. Read Vermeer SC552 commercial and industrial stump grinder reviews. It’s self-propelled when so many on the market are not. It’s very narrow, making it a good option to get into tight spaces. It has an auto-sweep system, exclusive to Vermeer, to help with cleanup. Routine maintenance is made easier with the Yellow Jacket Cutter System. It’s not a cost-effective option for small tree stump grinding jobs. You have to pay for an extended three year warranty. Dimensions: 141.6 x 51 x 72 inches. A27 inches above ground, 16 inches below ground. QHow many teeth does it use? QWhat is the cutting wheel dimension? Most stump removal tools are labor-intensive, hard to use, require a lot of maintenance and just don’t represent good buying. It seems Vermeer has taken onboard these many negatives and has produced a powerful stump cutter that turns a day’s work into work that can now be completed in mere hours. It has a 60HP engine, can help clean as you go and even fits into those hard-to-reach spaces. Overall, it’s easily one of the best stump grinders for the money. Check out what other people who purchased this product think about it. 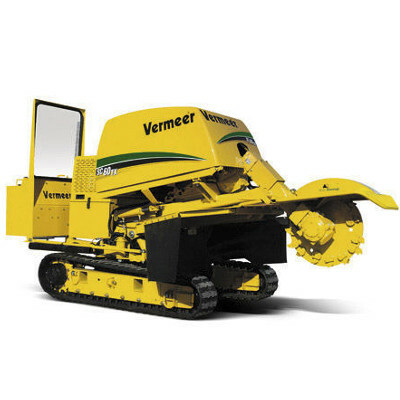 Read Vermeer SC60TX commercial and industrial stump reviews. It’s a productive tow-behind stump cutter, produced by a manufacturer that’s been around for three decades. It can be towed over rough terrain. Its tires are large, therefore expensive to replace. Maintenance takes a substantial amount of time to complete. Dimensions: 80 x 75 x 13 foot 3 inches. ATurbo-charged, four cylinder diesel engine. A24 inches below ground, 46 inches above ground. This Kubota stump cutter represents good value for money. 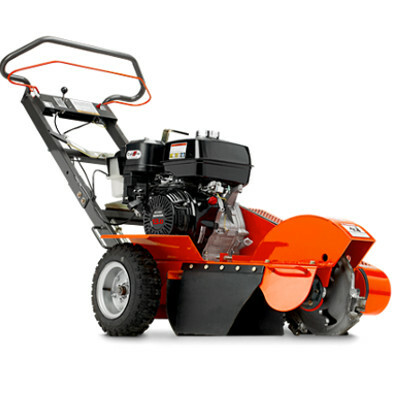 It’s powerful with a 74HP motor, has an extra-large cutting wheel and is even controlled remotely. What customers love about this machine, in particular, is its ability to go where many stump cutters cannot – into rough terrain. It has large tires which enable it to gain traction in mud, dirt and rocky terrain. This makes it the perfect product for professionals and those in industrial lines of work. Check out what other people who purchased this product think about it. Read Kubota 7500 commercial and industrial stump grinder reviews. Where to Buy Commercial & Industrial Stump Grinders? Although it may seem sensible to visit a physical store to find out further information about different manufacturers, models and brands, this is not always the case. 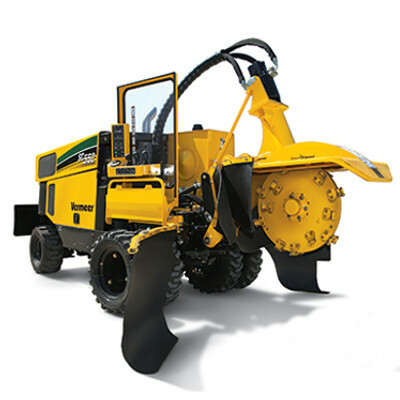 Often, the most affordable commercial tree stump grinding machines can be purchased online. In order to get the best deal, we recommend taking advantage of this opportunity. Buy online and you could potentially benefit financially.